Yes it fixed the problem. People have to CLOSE their browser to get it fixed. I will look later if it bring other issue. Thanks. I’m loving this plugin @louisadekoya, thank you for offering it for free. This may be outside of the scope of this plugin, but I have another use case: the option to add a second date to use as relative time instead of current date time. Let’s say you have a car. You have a PURCHASED date, and a SOLD date. By allowing a dynamic second date in the plugin, you could calculate something like " you owned this car for 2 years". Hi @petter, thanks. The plugin doesn’t currently support this feature. It was my original intention to include it right from the start but I couldn’t quite make it work. I’ll take another look during the week and let you know. Just started getting a error for every instance of Relativetime in my app. Just checked the demo site and the same error is occurring. Thanks for pointing out the error. Looks to have been resolved now (by the Bubble team). Just confirming that I ran into this bug as well but it seems to be resolved. It first manifested while I was using version 2.0.0 of this plugin. Upgraded to the new version, 2.1.0 and the issue persisted. But now things are working properly, so also of the belief it’s a Bubble bug. The ability to hide the suffix. So you can have the current value as “2 days” instead of “2 days ago”. Also works for the prefix, so “2 days” instead of “in 2 days”. The ability to express your date relative to a defined baseline date instead of current date/time. See @petter’s post above for an example use case. Thanks for the suggestion, Petter. I have updated the instructions and demo page. I hope you find the update useful. Making a great plugin even better. Really appreciate those changes! Thanks a lot, really great plugin! 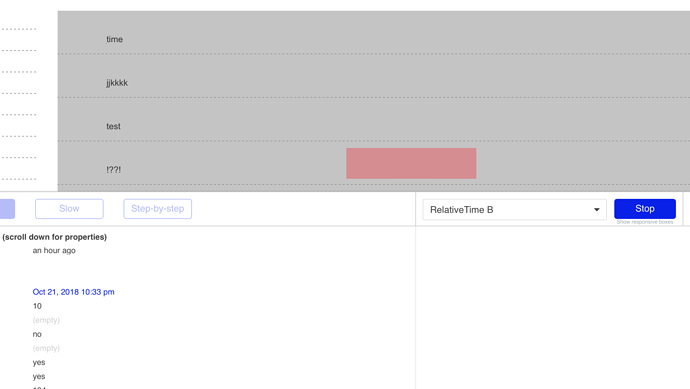 We would like have a relative time solution for a return data from API workflow. Do you know how we can hack this maybe using your plugin or something else? I haven’t tried it but if your API is returning a valid date, you should be able to use it as the source date for the plugin. 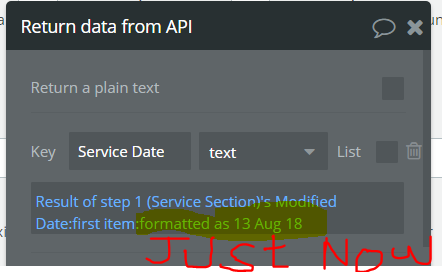 What I wish to be able to do using your plugin is to convert this date to relative time text via such a workflow before returning it to my app. The means I will return a text instead of a date value. Have you tried it yet? I think you should and let me know how you get on. The plugin element takes a date as input and spits out some text, so in theory, if you pass it your result of step 1’s modified date you can set your return text to the plugin element’s value. You’re part way there. In this case, you placed the relative time element in the repeating group. So, each individual cell would have its own relative value. However, to expose the generated value (ex. an hour ago), you need to pull it into a text element that references RelativeTime B’s value. Hey! Thanks for the awesome plugin. Is there a way to use Moments.js with different languages? Thanks - I’m pleased that you find the plugin useful. The moment.js library does support ‘locales’, but this is not included in the plugin. I gather it significantly increases the size of the library that is loaded. If this is very important to your app, I can create a private ‘with-locales’ version of the plugin, which I could grant your app access to, but I can’t guarantee that I will maintain it going forward as I don’t want to commit to maintaining two versions - unless lots of people want the locales feature. You can see it working here - note that the locale dropdown does not take a dynamic value. I’m afraid it would take more time than I have right now to make it so.